Question: RightStart, Singapore, or Math Mammoth? I am torn between using Right Start, Singapore, or Math Mammoth with my daughter who is just starting her schooling journey. Do you have any insight to share that might help? Yes. If you are torn, try Singapore with Math Mammoth (if you can afford both). I've heard from people who use both and say they go well together, because Singapore is somewhat lacking in practice exercises. There are lots of folks who use two curricula for math. You would basically use one of them as your "spine" that you go by, and then for each topic, check the corresponding lesson in the other, if it has good explanations or problems. You wouldn't do all problems in both. Then, if you like RightStart, buy their math games book (but not the whole curriculum), which allows you to incorporate their games into your math lessons here and there. Well, if you don't want to do trig or algebra 2, consider the book Mathematics, a Human Endeavor: A Textbook for Those Who Think They Don't Like the Subject. I hope these can be of help. Feel free to comment here at the blog. I've written a review of IXL.com (from "I excel"). It is an online math practice system - would be perfect for those of you who want your kids to have something for the summer months. 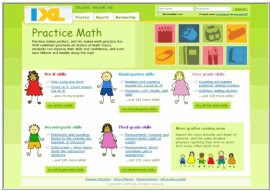 IXL has unlimited questions on hundreds of math topics and a comprehensive reporting system. Their pricing is $9.95 per month for 1st child and only $2 for the next child.